October was the 34th coolest month on record in Arizona, according to the National Weather Service in Phoenix. With some record rainfall and below-average temps, October 2018 was pretty cool. It was the 34th coolest month on record in Arizona, according to the National Weather Service in Phoenix. In Phoenix alone, October 2018 was an exciting month for weather. The month ended as the wettest October month on record and the third wettest month ever for the city. That's not to mention all the daily records that were broken too. 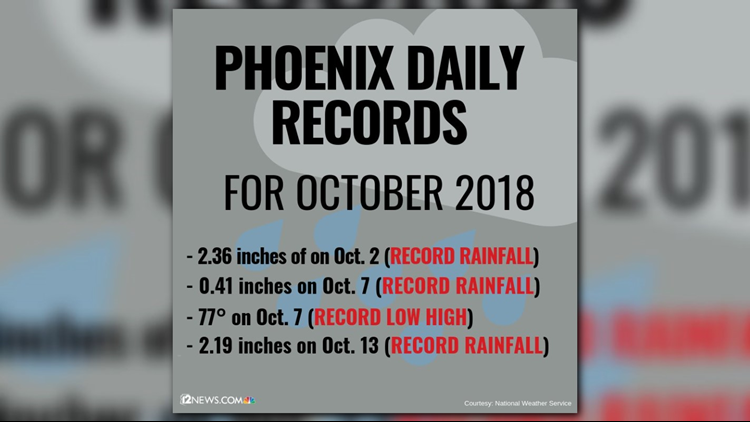 The graphic outlines new daily records in Phoenix set in October 2018. October 2018 was also one of the wettest Octobers for most locations across the High Country too, according to NWS Flagstaff. And northern Arizona even got snow. But the state did have its warmest September this year and despite all the October rain and cooler temps, 2018 is still on track to be the warmest year on record for Arizona.